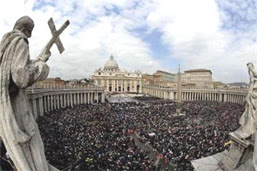 Angelus and Regina Coeli (1,206,000 people). These statistics show an increase with respect to the last three years, and refer only to meetings that took place in the Vatican or at Castelgandolfo. The statistics do not include the many thousands of faithful who came to see the Holy Father on his journeys in Italy or abroad. The Prefecture of the Pontifical Household explains that the numbers are approximate, calculated on the basis of requests to participate in meetings with the Pope and on the tickets distributed, as well as on estimations of people present at events such as the Angelus or large celebrations in St. Peter's Square. The single event which brought together the largest number of faithful was the beatification of John Paul II on 1 May.